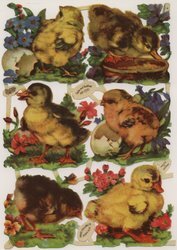 inside right: THESE LITTLE CHICKS HAVE COME TO SAY "WE WISH YOU JOY THIS EASTER DAY ... AND HAPPINESS YOUR WHOLE LIFE THROUGH!" 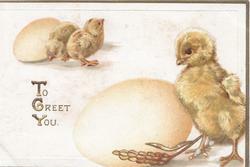 inscription on egg: WE MAY NOT SEE AS MANY EGGS ... 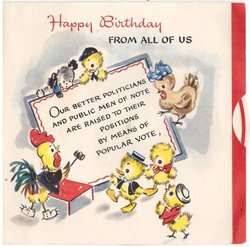 IN THE FUTURE TOO! inside right: WITH LOTS OF LOVE AT EASTER .... AND THAT, OF COURSE, IS YOU! 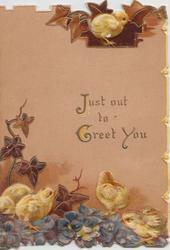 inside right top:-"HAPPILY MAY THE MOMENTS GLIDE THAT CARRY YOU THROUGH CHRISTMAS-TIDE"
inside right top:-"BE MINE THIS MESSAGE GLAD TO BEAR, BE YOURS THE SEASON'S JOYS TO SHARE." 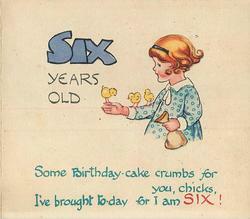 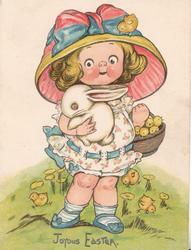 inside right below::- IT IS THE CHILDREN'S FESTAL DAY, AND UNTO YOU, MY LITTLE FRIEND, MAY PLEASURES COME IN BRIGHT ARRAY FROM ITS BEGINNING TO ITS END. 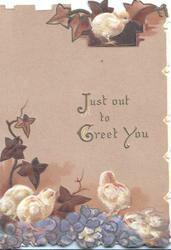 below:- A HEARTY CHRISTMAS GREETING YOUR HAPPY EYES FOR MEETING THIS LITTLE CARD CONVEYS, MAY NE'ER A CLOUD O'ERTAKE IT. 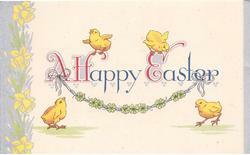 below:- MERRY, MERRY MAY YOU BE, FULL OF FUN, CONTENT, AND GLEE WHILE THE JOY-BELLS CHIME = EVERY HEART AND FACE BE GAY ROUND YOUR HAPPY HEARTH, AND MAY YOU HAVE A RIGHT GOOD TIME. 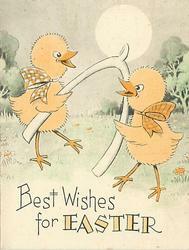 below:-OF COURSE I MUST KEEP BACK A FEW MOST CHARMING HOPES TO SEND TO YOU, MAY EASTER FAIRIES WORK ALL NIGHT AT MAKING THINGS FOR YOUR DELIGHT! 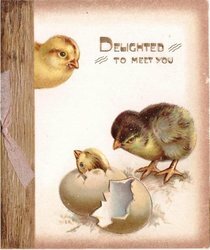 below:-I DON'T KNOW WHOSE THE CHICK MAY BE, BUT STILL THAT DOESN'T MATTER, YOU'LL KNOW I COMES TO YOU FROM ME, OF PLEASANT THINGS TO CHATTER: AND WISH THAT SEASONABLE JOYS MAY GLADDEN ALL GOOD GIRLS AND BOYS. 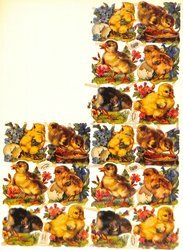 below:-ALL PEOPLE, SMALL AS WELL AS GREAT, IN LIFE MUST BURDENS BEAR; WE'RE TOLD THIS IS A COMMON FATE, APPARENT EVERYWHERE. 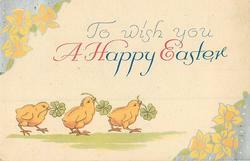 MAY WHAT YOU BEAR THIS EASTER-TIDE NOT CARE BUT HAPPINESS PROVIDE! 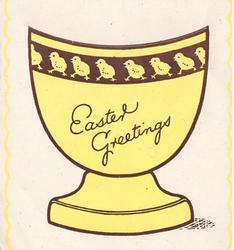 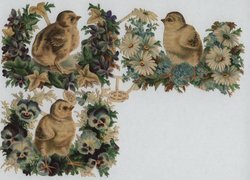 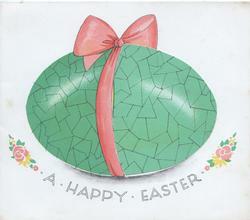 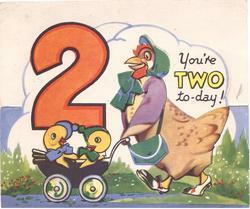 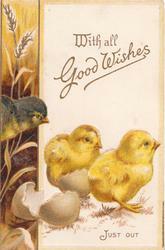 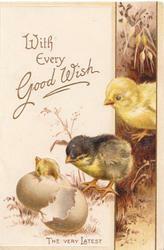 image used for Postcard set 1001 JOYOUS EASTER, card title A LOAD OF EASTER GREETINGS! 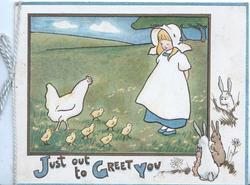 below:-THE WORLD IS FILLED ALL ROUND ABOUT WITH FOLK OF EVERY SORT. 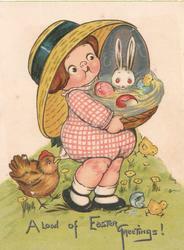 BOTH DARK AND FAIR, AND THIN AND STOUT AND ALSO TALL AND SHORT, BUT ALL, WHEN EASTER TIME IS NIGH, CRY "JOY BE WITH YOU!" 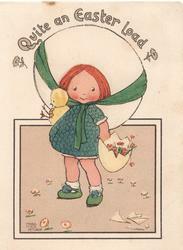 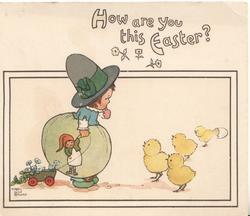 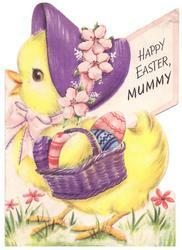 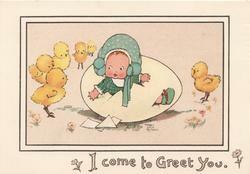 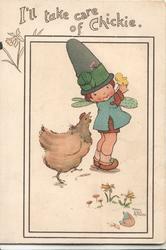 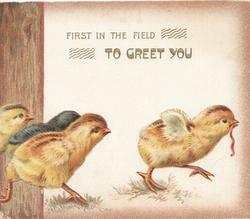 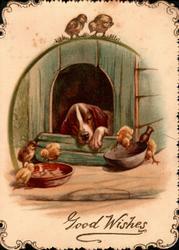 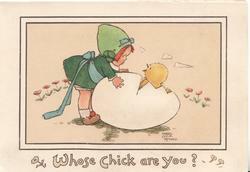 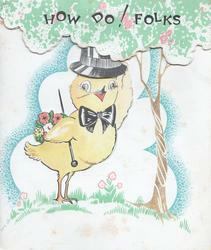 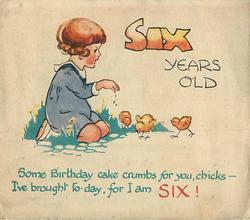 - SO DO I.
image used for Postcard set 1001 set & card title JOYOUS EASTER.